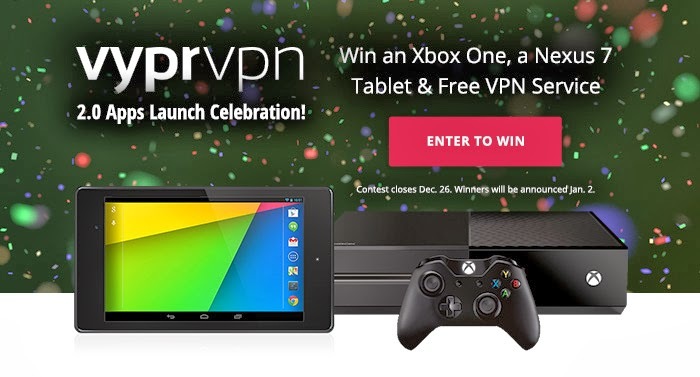 Enter the VyprVPN 2.0 Launch Giveaway to Win an Xbox One, Nexus Tablet & Free VPN Service! Our trusted partner Golden Frog just launched the sleek, new VyprVPN 2.0 Apps for Windows, Mac, Android and iOS last week. Giganews members with VyprVPN will love the 2.0 apps for being faster, easier-to-use, and more stable and intuitive than any other VPN app! As part of Golden Frog's VyprVPN 2.0 launch celebration, you can enter their month-long giveaway to win fabulous prizes like an Xbox One, a Nexus 7 tablet and one-year VyprVPN Premier Accounts! You can choose how you enter the giveaway from a list of approved actions! Plus they're allowing unlimited entries over the next four weeks, so go back to the page every day to get additional entries. Conditions Apply. Must be 18 years of age to enter. Contest closes at midnight CST on Dec. 26, 2013. Weekly winners will be announced every Monday and grand prize winners will be announced on Jan. 2, 2014 on Facebook and Twitter. Shipping date of prizes is subject to availability of items. Participation in this promotion is subject to Golden Frog's official rules which can be seen inside the contest widget here.